Ylläs-Levi 70 km and 55 km are classic technique long distance ski races. Here are some hints and tips for the first-timers. Your ski boot determines what binding you need to have on your skis so choose your boots before you buy your skis. Before you go shopping for ski boots, ask yourself: How important is comfort? Do I need a broad or a narrow boot? How about weight? Extra insulation? After you know the answers for these, a shop assistant will be able to help you. Try to find suitable and comfortable ski boots. The skis are the most important pieces of equipment in skiing. Try to find skis that will give you both a good kick and a fast glide. You could either get waxable or waxless skis. In general more expensive skis are lighter and have a base that will make you glide better. For the first time long distance skiers it is advised to ask for ski shop assistant’s professional help when buying skis. Pay attention to straps in ski poles. You should check and test which straps fit your hands with your ski gloves on. In classic technique skiing the correct length for your ski poles is 0,83-0,86 times your own height. For a 185 cm skier the appropriate pole lenght is therefore 154 – 159 cm. 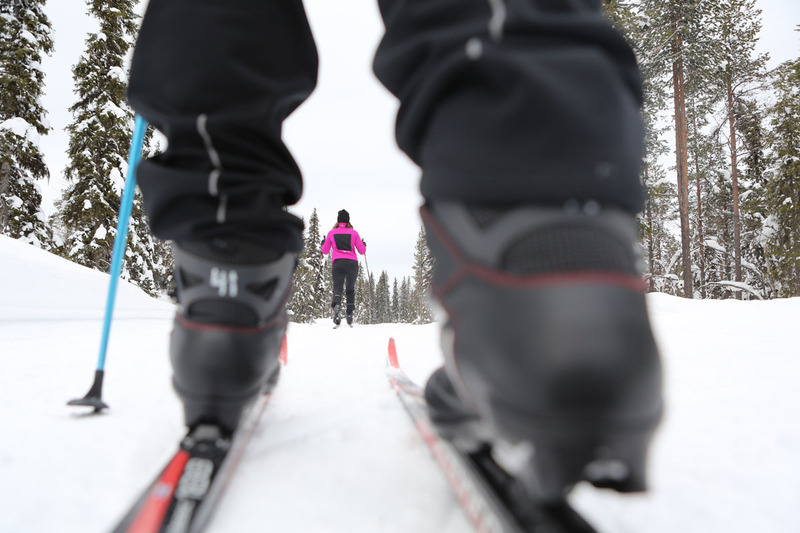 Besides boots, skis, bindings and poles you need correct clothing for cross-country skiing. Choose clothing according to weather. Winter running clothes work very well also for skiing. For cold weather skiing a good advice is to use wool instead of synthetic material as a base layer. Wool is comfortable, warm and does not get cold when getting wet from perspiration. Get help with technique. The easiest way to learn the correct technique for skiing is to get help. You can for example take private ski lessons or sign up for a ski camp with an instructor. You can let someone videotape your skiing and compare your technique with good skiers. You can also watch ski DVDs and videos to boost your learning. After improving your technique it is time to start with more organized training. Vary your workouts. You should mix short, long, hard and easy workouts to your training plan. Make sure that easy workouts are easy. Medium workouts should be quite long, since they will imitate a long distance race quite well. For hard training you can try some intervals. Make a commitment and sign up for a ski race or a ski event. The earlier you do it the more you will enjoy it as you start to prepare and plan for the event. Ylläs-Levi 70 & 55 km distances are a really nice main goal for your ski season and you can make it a combination of a ski trip and a vacation. To prepare for this event the best practice is to participate in a smaller race. This will give you valuable first hand experience for how you should eat and drink, how you should dress and how you should wax your skis. Please, stay tuned as we will post more information about training for long distance skiing and tips for preparations! There will be articles, videos and social media updates on regular basis. Check out our website and Facebook site.